Randy PItchford, co-Founder and President of Gearbox Software, applies concepts from magic to game design. Possibly the most aptly named talk of the 2013 D.I.C.E. Summit, Randy PItchford's "Videogames Are Magic" presentation was a blend of comedy, magic, and, of course, videogames. In addition to being President of Gearbox Software, Pitchford is a surprisingly talented magician, and he applies some of the concepts from this art to his work in games. In particular, he suggests that choices are integral to the experience of the audience, in both magic and games, and that offering a choice is the best way to get a player invested in what's going on. To illustrate his point, and to show off his magic skills, he offered an audience member a choice of two decks of playing cards. When the audience member chose the blue deck, he gave it to him as a gift and continued his performance with the red deck. His point here was that the option was false, no matter what, he was going to perform the trick with the red deck, but all the same, it got the audience invested in the performance. This applies to videogames in that players are frequently presented with decisions to make over the course of a story being told, but the result is the same regardless, so these choices are false. With some exceptions, games have a single ending, which all players, regardless of the choices they make throughout, will eventually experience. "Choices are good," he said, "even if they're meaningless choices." Though there are limits to the number of options you want to give to a player in any given decision they have to make. Referencing an experiment of sorts, he described a grocery store setting out two sample displays. One of them had six choices, while the other had 24. More people stopped at the display with 24 options, but they largely couldn't make a decision from so many options. While more people perused the 24 option display, significantly more people actually made purchases, representing a decision, at the six choice display. In games, he argues, you want to offer choices frequently, but you have to limit the number of options you provide, or the player experience will suffer. While choices are crucial for the playing experience, when it comes to purchasing decisions, you don't want to offer choices at all. 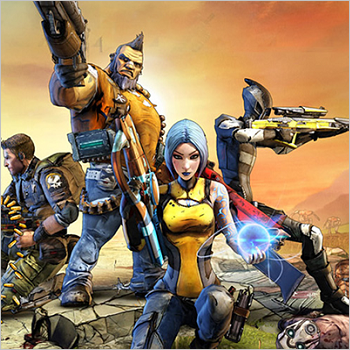 In creating Borderlands, for example, Pitchford stated that he didn't want to compete with another game, rather he wanted to offer something novel. This created a "yes or no decision" rather than a "Pepsi or Coke decision," where players would only have to decide whether they wanted to play a game like Borderlands, instead of having to decide between two similar games. Once players have made that yes or no decision, there is still work to do to ensure that the players feel that they made the right choice. Early on in the process, developers have to "establish our credibility," citing the action-packed intro to Borderlands 2, "validate the promise we made," by giving the player the experience they paid for, and ultimately "deliver the goods" to the players in the form of gameplay and story. To Randy Pitchford, captivating a player with a game and captivating an audience with an illusion often require the same set of tools, and a lot of it boils down to choice.